ATLANTA, Ga. (September 19, 2016) – Chick-fil-A® announces today a new initiative that will more than double the company’s investment in Team Members’ college educations – providing $4.9 Million in scholarships in 2017 alone, as well as access to tuition discounts and other benefits at more than 70 colleges and universities nationwide. While Chick-fil-A has offered scholarships for more than 40 years, the enhanced initiative, called Remarkable Futures, increases the amount of funding per recipient, allowing students to receive up to $25,000 in scholarships to be applied at any accredited institution of their choice, including online and on-campus formats, and can be combined with tuition discounts and other educational benefits at participating institutions. This investment in Chick-fil-A Team Members represents a significant, industry-leading initiative, both in the number of scholarships given (more than 1,850 expected in 2017) and total financial investment in Team Members ($4.9 Million). Chick-fil-A scholarship recipients have the flexibility to apply the funds at the traditional campus or online institution of the student’s choice, and there is also no length-of-service requirement associated with eligibility. Because the goal of this initiative is to build community leaders, scholarships will be awarded based on factors like leadership and community involvement, in addition to academic achievement. Chick-fil-A Leadership Scholarship: In 2017, 1,850 students will have an opportunity to receive a $2,500 scholarship for the 2017-2018 academic year, with the ability to re-apply for up to four years – for a potential total of up to $10,000 for college while working at a Chick-fil-A restaurant. These scholarships will be awarded to Chick-fil-A Team Members based on leadership, academic achievement and community involvement. 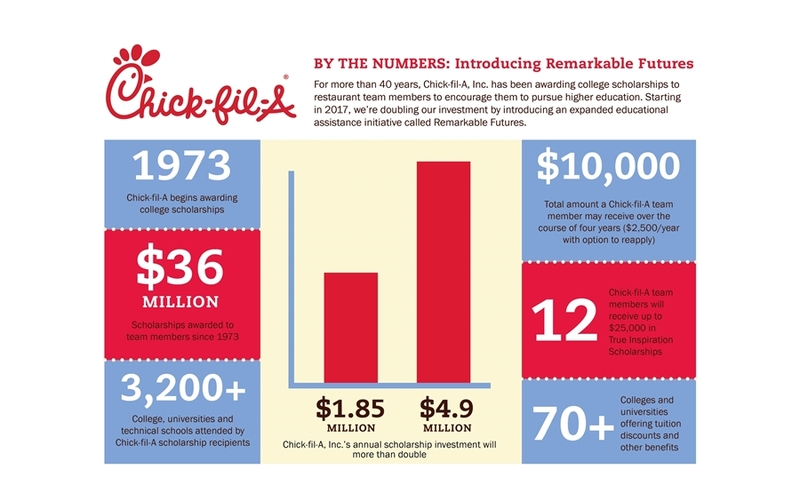 While this scholarship is not new (Chick-fil-A has awarded $36 Million in scholarships since 1973), the amount has more than doubled from the previous scholarship, which offered $1,000 and was non-renewable. Chick-fil-A, Inc. began awarding scholarships to Team Members in 1973 based on founder S. Truett Cathy’s desire to incentivize Team Members to further their education. Since then, nearly 36,000 Team Members have received scholarships from Chick-fil-A, Inc., bringing the total amount to nearly $36 million applied at more than 3,000 schools nationwide.